Intervention and Reflection (Defective Printing) 9 Edition In INTERVENTION AND REFLECTION, nationally acclaimed bioethicist and novelist Ronald Munson masterfully weds clear and accurate accounts of complex scientific findings with case presentations whose vivid narrative helps students connect science with the human emotion behind important and controversial biomedical decisions. These engaging cases and briefings conclude with succinct summaries of basic ethical theories and are followed by up-to-date and influential articles addressing the most pressing issues in bioethics today. The vibrant writing, along with the wide variety of current cases and issues, make the book appealing and provocative to readers ranging from those with no philosophical or scientific training to those in programs in philosophy, nursing, or medicine. 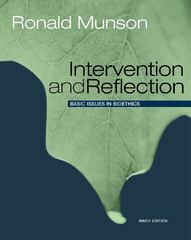 You will quickly learn why INTERVENTION AND REFLECTION continues to be the most widely used bioethics textbook on the market: This unusual text is surprisingly hard to put down.